This Halloween, Sentosa 4D Adventureland in collaboration with Singapore Polytechnic is getting you TRAPPED at Fright Nites 4D Adventureland. An act of jealousy caused a series of misfortunes. Are you the next unlucky soul stepping into the territory and uncover the secrets beneath their hate-filled faces? Can you stop them on preying on their next victim? 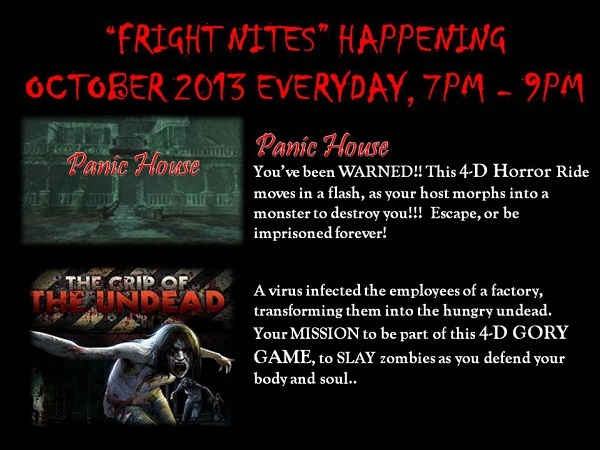 This 4D Horror Ride moves in a flash, as your host morphs into a monster to destroy you!! Escape or be imprisoned forever! A virus infected the employees of a factory, transforming them into the hungry undead. Your mission is to be part of this 4D GORY GAME, to SLAY the zombies as you defend your body and soul. Sales from 01 Aug – 31 Aug 2013. 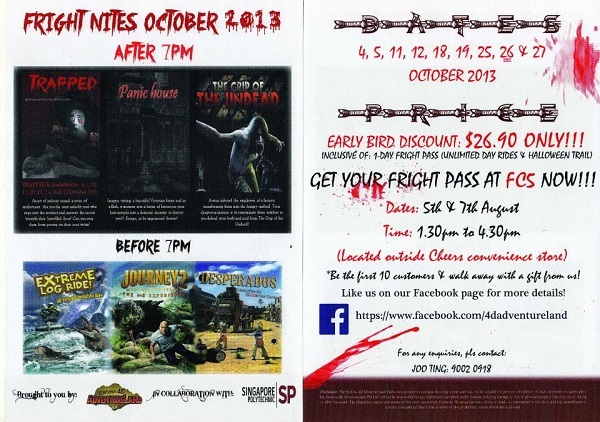 Inclusive of 1 day fright pass (unlimited day rides and halloween trail). Sales from 1st Sep 2013. For further information and to buy event tickets, visit Sentosa 4D Adventureland website.